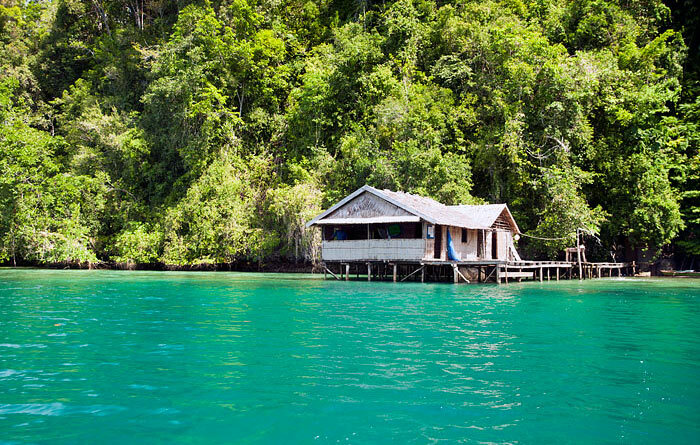 Warikaf Homestay is a two room bungalow built over water in a unique and isolated location in a ‘hidden bay’ amid the Wayag-like karst islands of northern Kabui Bay. 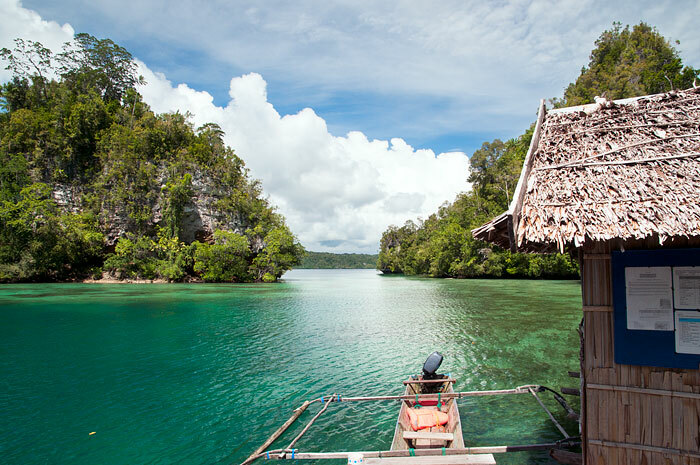 Named for the fresh spring water that emerges from a nearby cave, Warikaf was originally built as a stopover for sea kayakers exploring Kabui Bay and is splendidly remote. There is no phone network coverage. A generator is provided for lighting and charging devices. 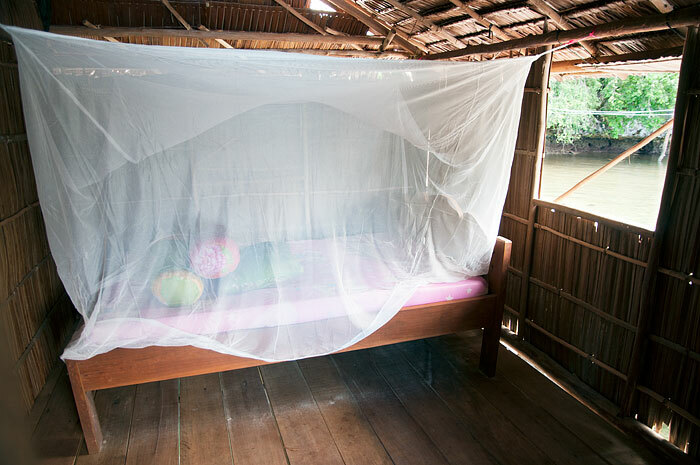 Warikaf’s two rooms have free standing double beds with mattress covers, pillows, bolsters and mosquito nets and share a large verandah with a table and wooden chairs. 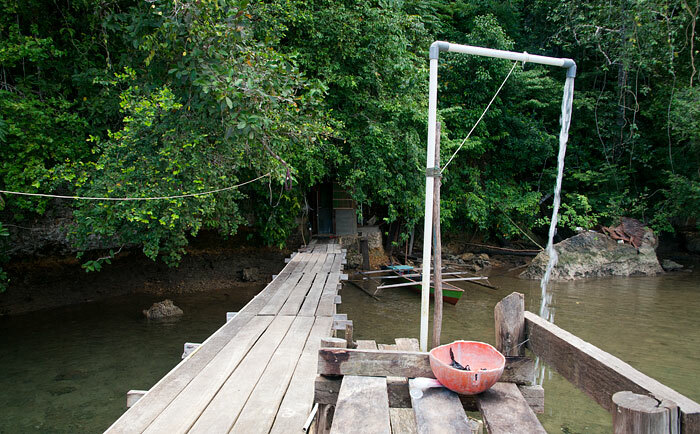 There is free flowing gravity fed spring water from a standpipe on a boardwalk jetty that connects the homestay to Gam Island. (The water is boiled for drinking.) 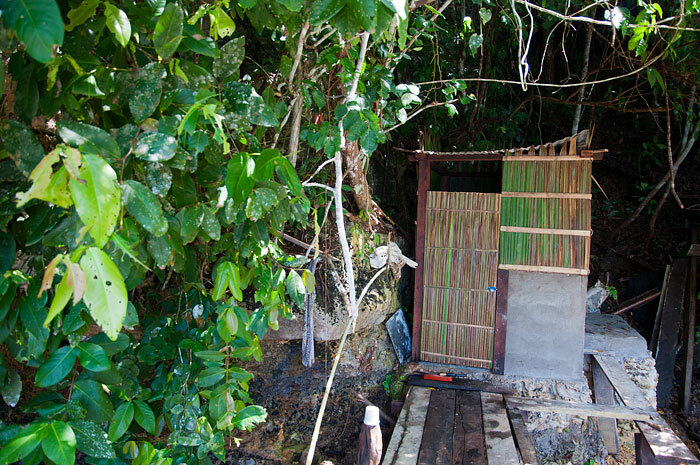 A combined concrete floored dip mandi bathroom and squat toilet is on the island at the end of the boardwalk. 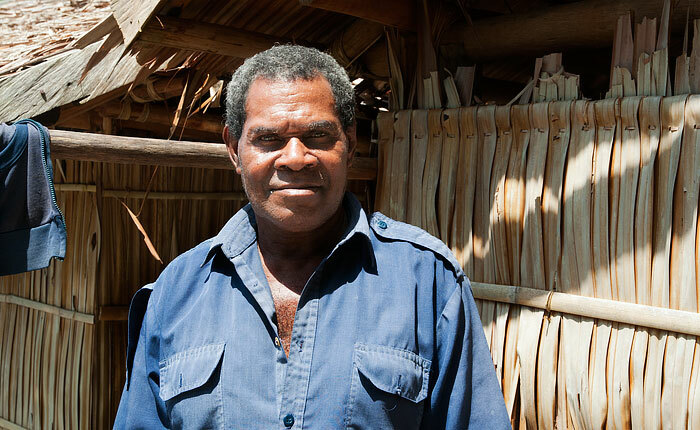 It’s a 30 minute trip by boat to the nearest village where only basic supplies can be purchased, so it’s best to bring everything you’ll need with you. Warikaf Homestay owner Pak Daud Mayor and his wife live on site while guests are staying, but have no English, so be sure to bring a phrasebook if you have no Bahasa Indonesia. 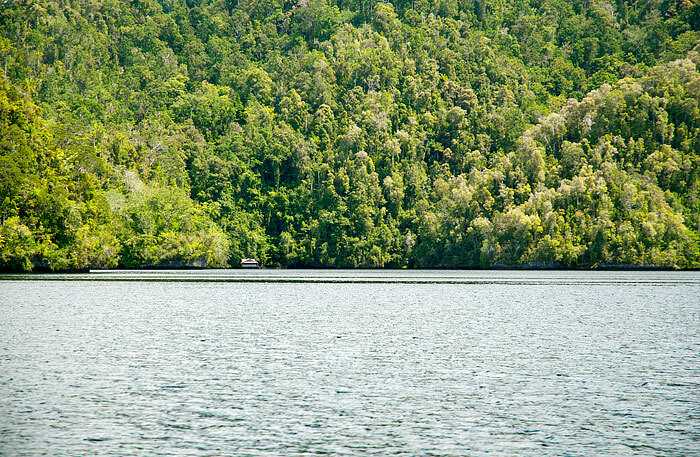 Transport from and to Waisai is by longboat and costs IDR 500,000 each way, shared between up to 3 people. 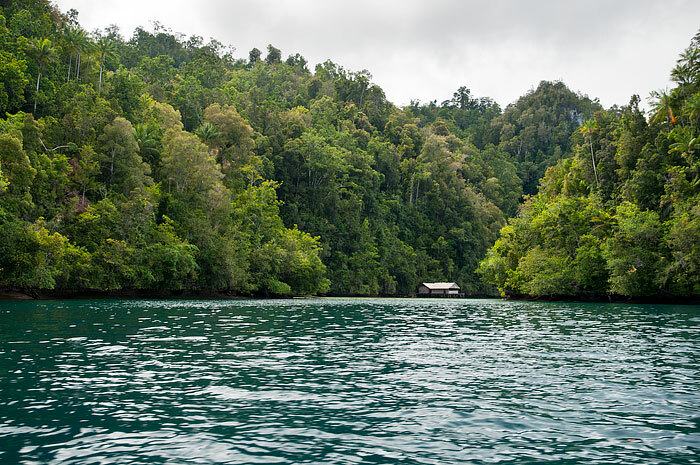 For more than 3 passengers a speedboat would need to be chartered at a cost of IDR 500,000 per person each way. The journey to Warikaf gives passengers a good look at Kabui Bay. 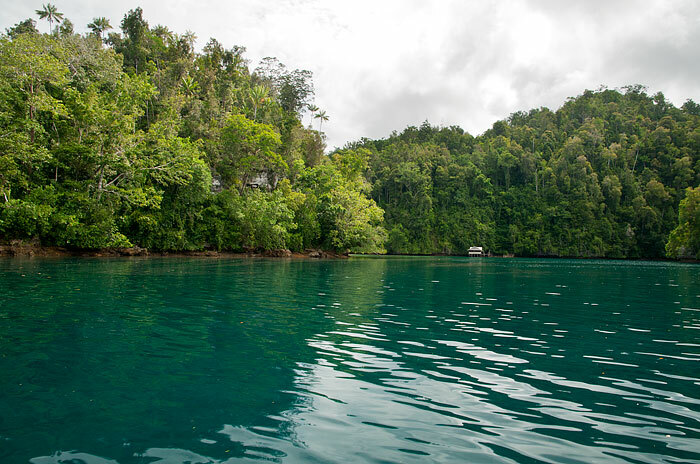 Warikaf Homestay’s bay provides good snorkeling. Backed by a thin fringe of mangroves, the bay is patrolled by black tipped sharks and visited by schools of juvenile fish and occasionally by hunting dolphins. 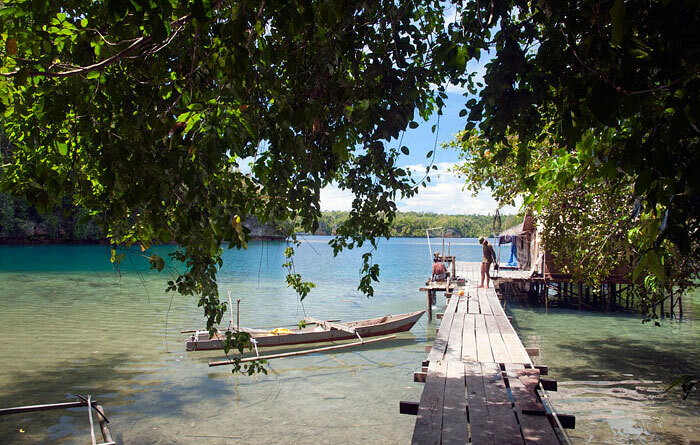 The entrance to the famed dive and snorkel site of the Kabui Passage is close by, and the village of Kabui can be reached in 30 mins by boat, or via a 3 to 4 hour hike through the jungle of the island’s north shore. Local sightseeing trips and village visits can be arranged for IDR 100,000 per person. 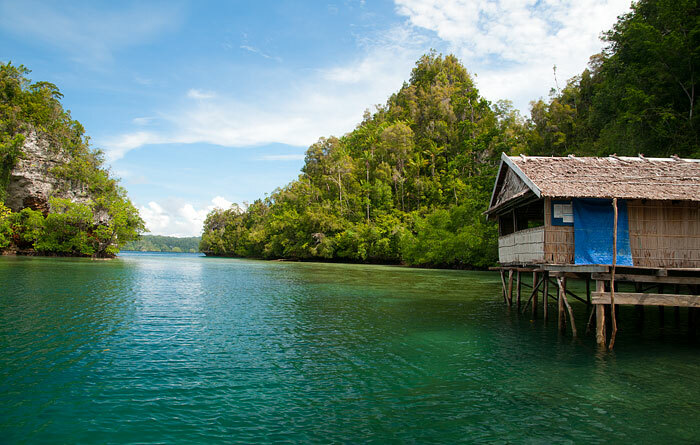 The same cost will cover snorkelling trips to Kabui Passage or around the karst islands of Kabui Bay, which are very similar to the famed islands of the much more distant Wayag. Birds of Paradise can be seen at Kabui village, and for the intrepid, it’s possible to arrange a trek from there over into Gam Bay. Another possible trek is from Kabui across the hills into Yenwaupnor village. The trek affords panoramic views of Kabui and Gam Bays and can be accomplished in a few hours. 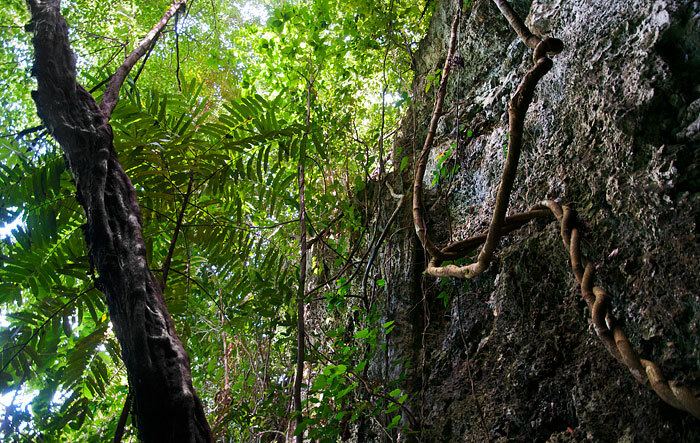 The Gam jungle itself is home to mound building wild bush fowl, cuscus, bandicoots and hosts of birds. We had lunch here after swimming in Kabui Passage (which, despite the aggressive croc warnings that we weren’t aware of, was amazing). 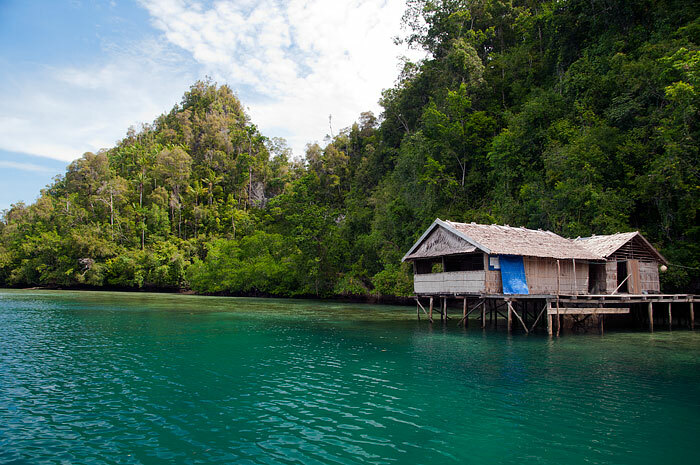 Warikaf is one of the most serene and secluded places in the world, and is a highlight of Raja Ampat. I can’t comment on the accommodation, food, or local family, but certainly the scenery is incredible. There were so many fish under the pier that you can’t actually see any light if you dive down. Would stay here if I came back! Hi, is there good snorkeling around the homestay, excluding the passage? Also, is it safe, considering it’s a mangrove? 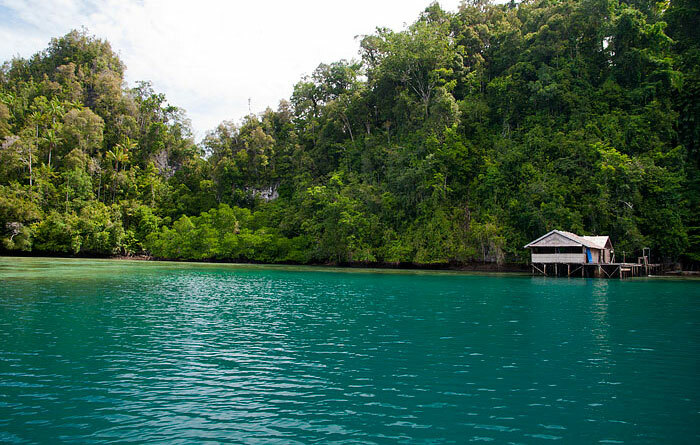 We’ve never snorkelled there personally, so can’t say for sure, but we saw coral bommies and many small sharks and fish on the way in and from the homestay dock, so we imagine it’s quite good. Quite different to the reefs around islands in the open ocean, though. Also can’t be certain about safety, although it’s very close to the passage itself, where lots of people have dived and snorkelled without incident to date. We’ve never heard any negative reports from around there, and your hosts would certainly not let you snorkel anywhere they thought there was definite risk. Hope that helps! It would be possible to organize a transfer from there to Fam Island watching Pyanemo on The way? How much it will cost? Thank you in advance. thank you. I was in contact with the Homestay of Fam (our next destination) and they are agree to bring us there fro 1.500.000 rupies. I think is a right price. We stayed at Warikaf for 1 night during our kayak trip around Gam. 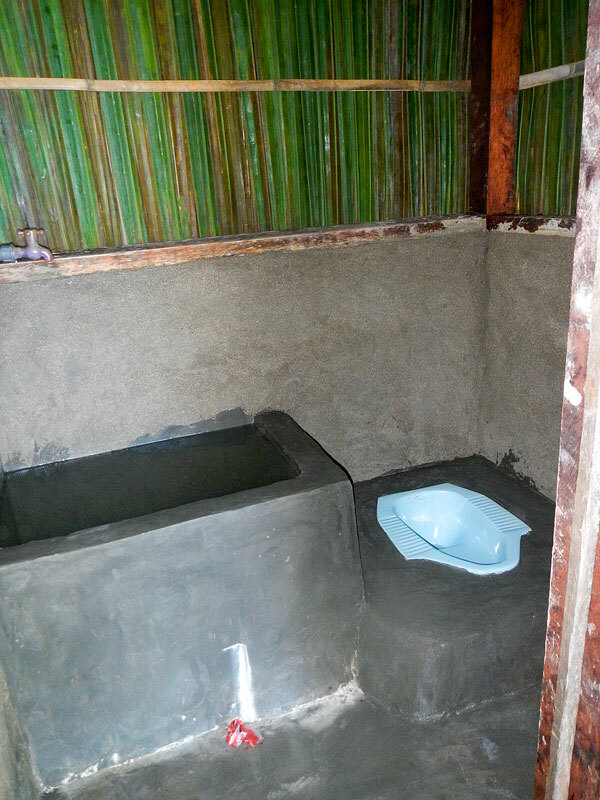 It is on a great location next to the Passage, and very remote from any village or other accomodation. There is no beach, but plenty of deck area to walk around with a large communal dining and rest area. Our meals were great, fresh fish for dinner and breakfast. However, watch out for the very slippery boardwalk to the dip mandi where the owner cleans the fish, this needs to be scrubbed clean to avoid falling on the deck as we did on our visit. I know I can take a boat/speedboat from Waisai to get here- but when I want to go back, or potentially visit a different homestay (thinking about going to Beser Bay after this one), how would I get from here to there? Also, I saw someone mention a kayak in the comments, is there a way to rent a kayak and explore the Kabui area from here? 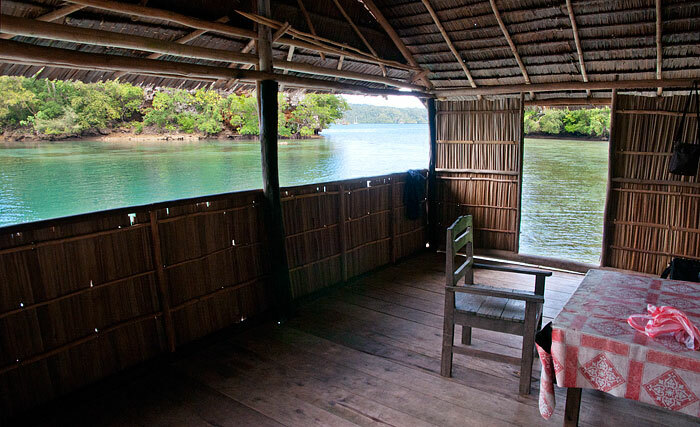 All homestays can arrange tours of Kabui Bay and organise transport to other homestays and back to Waisai. These and many other questions are all answered in the pages linked from our step by step guide. See this page for kaying info. Can I get a transfer from here to Sawinggrai? How much will it cost? It’s actually possible to walk from the nearby village of Kabui across the heights of Gam to Gam Bay, where you could get picked up and transferred to Sawinggrai. 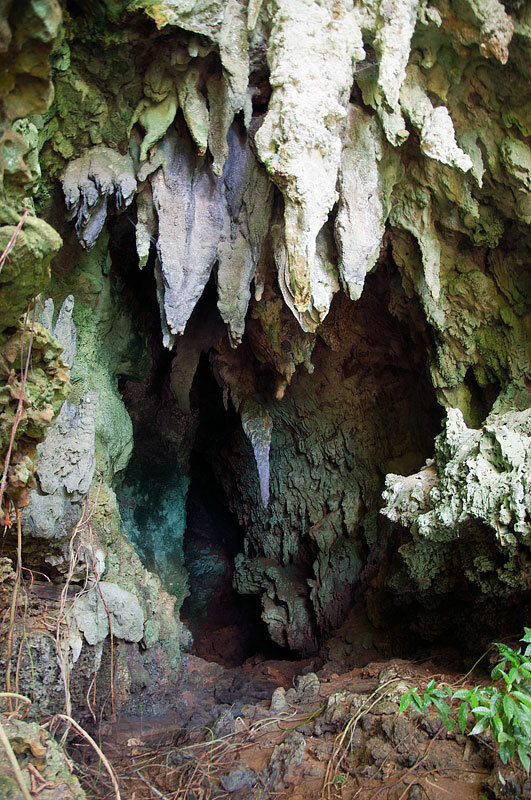 See the Jungle trekking heading in the Activities section of Nudibranch Homestay’s page for more info about that. Can you do the trek into Yenwaupnor village by yourself? Or do you need a guide? We think you’d more than likely need a guide. The route wouldn’t be marked and the terrain is rough and jungled! Hello! I sent them a text on the mobile number mentioned about availability during the month of October- it has been a week but im still awaiting a reply. Could you please suggest any other method of getting in touch with them? 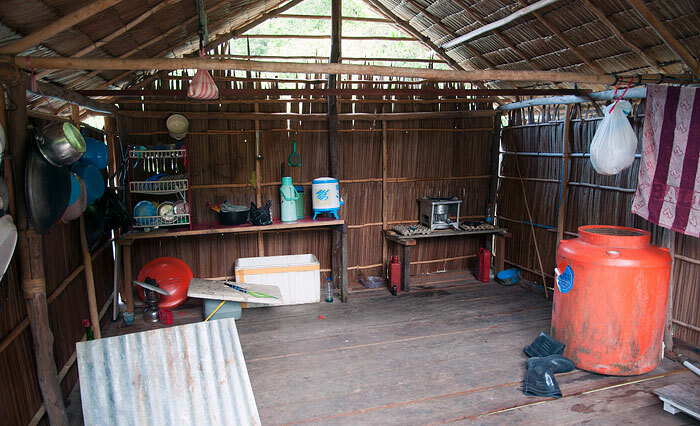 Also, i would like to know if this homestay offers day trip to Wayag. You could try using the booking form. It’s free for both you and the homestay and sends an SMS in Bahasa Indonesia, which is a big help for homestay owners like Pak Daud who don’t speak English. They are the only 2 methods available for Warikaf. Thank you very much for your timely and kind reply. The problem is I want to visit Wayag also, so could you please recommend a way to do both- stay at a nearby homestay/ island which will arrange the day trip to Wayag, and then we can move to Warikaf? Sorry for trouble with my questions. Thank you. Use the advanced search on the accommodation page to quickly find all the homestays offering Wayag trips and arrange a transfer to Warikaf from the homestay you choose. Thank you, i have requested for the booking by filling out the booking form just now, but i forgot to tick on ‘pick up from waisai’. May i know how to edit the form? please help. The booking form just translates your request to Bahasa Indonesia and sends it to the homestay as an SMS, so you can’t edit the form. You’ll have to wait for a reply. Please read this information so you understand how the system works. Is this price – 400.000 – includes meals? 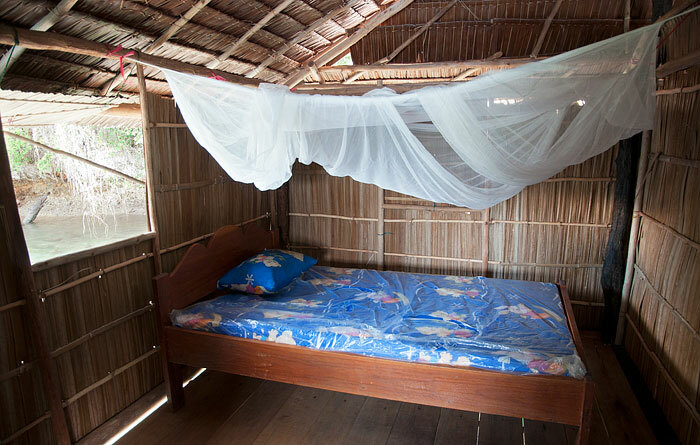 Yes, all homestay accommodation prices include 3 basic meals a day. You can read more about homestay food on this page. any idea how long is the boat travel from waisai to warikaf? Hi Sue – A longboat with a 15HP outboard in smooth seas takes a little over an hour. Maybe 40 minutes by speedboat? Somebody knows if 400.000 is the price if there is only one peole?The double room is cheaper, i suposse? The rate is per person per night, so unless prices have changed since we last confirmed them, a room for two people would be 800,000. So if I am traveling solo would I have to pay for two people? what was your stay like? Could you share some feedback please.